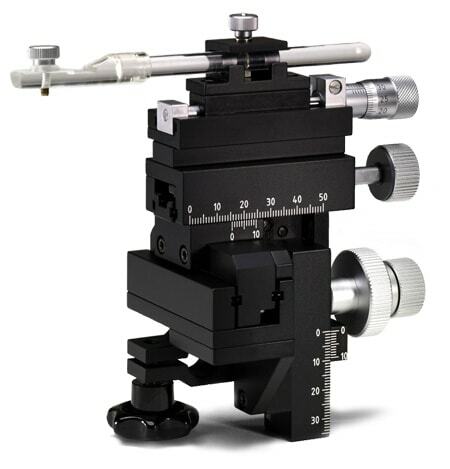 Used in complex experiments in conjunction with our other micromanipulators, or as a stand alone unit in a teaching environment, the MM-33 is available separately for those wishing a small, practical instrument in applications not requiring submicron accuracy. The optional rotating base extends the utility of the MM-33 by providing two additional rotating planes. The rotation in the horizontal plane (approximately 120 degrees) has a positive stop, quick release mechanism for fast insertion and removal of pipettes. The second rotating axis allows the MM-33 to be tilted in a vertical plane from 0 to 70 degrees. 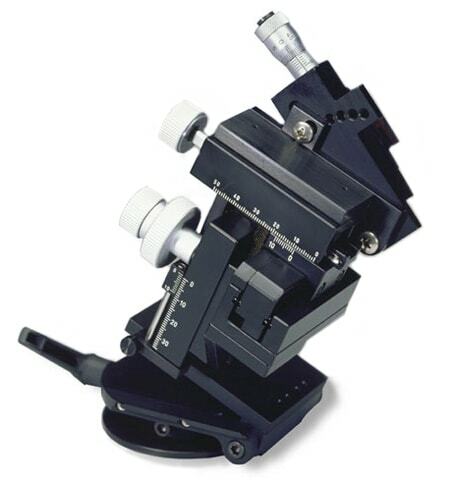 The optional tiltable X-axis allows the fine axis to be tilted up to 45 degrees. These options should be ordered at the time of purchase since the modifications are factory installed. Compact design allows use in tight environments. Cross-loaded roller bearings for smooth, low friction movement. Rack and pinion drive gives stable movement with minimal backlash. Rotating base allows horizontal rotation and vertical tilting.